Adam is Philadelphia born and raised. He attended Temple University, was commissioned through PLC combined program, and became a Ground Intelligence Officer. He worked as the S2 at 2d Tank Battalion out of Camp Lejeune, NC and attached to 3/8 on an Afghan Police Advisor Team. 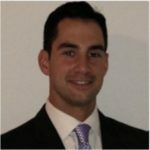 He is a 2016 graduate of NYU Stern, and is currently an Investment Banking Associate with Citi. Adam is also currently involved in the Wall Street Warfighers Foundation.